Trail mix variety pack from Trader Joe's featuring Omega Trek, Happy Trekking and Rainbow's End bags. 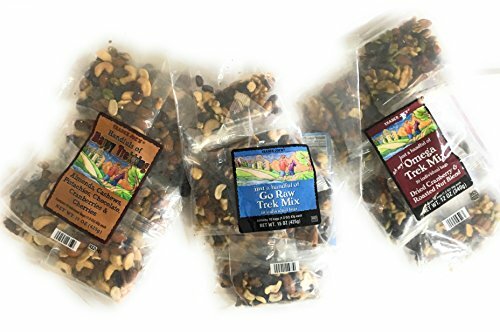 The ultimate travel snack whether you are in the office, school, camping, or on a hike or hunt. Each 15 oz package contains 10 1.5 oz single serve mini packets. Omega Trek contains 500mg of Ala Omega 3 per serving, and a healthy medley of dried cranberries, dry roasted salted almonds, pecans, pistachios, dry roasted pumpkin seeds, and walnuts. Happy Trekking has a classic blend of roasted almonds, dry roasted pistachios, roasted salted cashews, chocolate chips, cranberries and tart cherries. Go Raw contains a natural assortment of raisins, cashews, walnuts, almonds, and filberts (hazels nuts). This healthy pack with its individual small bags is great to grab and go. No more measuring it out in a container, just grab a package and run. You can add extra crunch and flavor to your favorite foods. Grab now so you can mix and match your favorite combination of nuts. If you have any questions about this product by TJ's, contact us by completing and submitting the form below. If you are looking for a specif part number, please include it with your message.